We have an Istanbul derby to look forward to on Thursday evening and this game may be a lot closer than what it looked like being a few weeks ago. Fenerbahce have a 4-3 record coming into this game while Anadolu Efes have a 3-4 record and an away win will level these teams out. Fenerbahce have lost their last three games, they held a 100% win rate after four games of the season while Anadolu have won three of their last four games. It was a win away in Istanbul, in Round 4, that gave Anadolu their first win of the season, transforming them into the side that comes into this game with optimism and confidence. European games between domestic rivals are often difficult to call and this may be the game that Fenerbahce have been looking for in order to get their season back on track. A win over a rival that they have faced so many times may be the kick-start their European season needs and that is what the home fans will be looking for on Thursday night. Bogdan Bogdanovic is still the top man for Fenerbahce and he can call on an average of 13.3 points per game this season. If he can improve that tally this midweek, his team may get their mojo working once again. A 104-99 win over UNICS Kazan got this week off to a flying start for Anadolu and it helped them get back on track after losing to Milan in their previous game.Thomas Heurtel has been in flying form this season and he managed to grab 24 points and 8 assists in the win in Russia on Tuesday. The team clocked up 34 assists in this game, which is a record for them. Heurtel currently has an average of 12.9 points per game while DeShaun Thomas leads the way with an average of 13.6 points per game this campaign. The bookies think this will be the game when the hosts get back on track and there is no reason why they can’t. 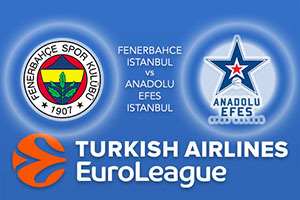 However, take Anadolu Efes Istanbul at +6.5, which is provided at odds of 1.90. There is an Over/Under market for this game and you should look to go OVER 161.5 which is provided at odds of 1.90. Bet Now!